Maitreya has two adorable footwear releases this week! These new Shearling Boots are gorgeous and is scripted to change Laces, Metal and Straps color. This can be worn with alpha or (the old) invisiprim version – I personally love alpha cos it doesn’t interfere with poses or when shadows is enabled! Here is a pair of Shearling Boots in Bistre with one example of what a simple re-color can do; the possibilities are endless with all the color choices offered. Have you seen the new Maitreya Scrunched PrimSocks? These PrimSocks are scripted to change appearance to Flat, Tip Toe, or Hide Feet (to wear with any shoes). The cuffs are also scripted to change colors! 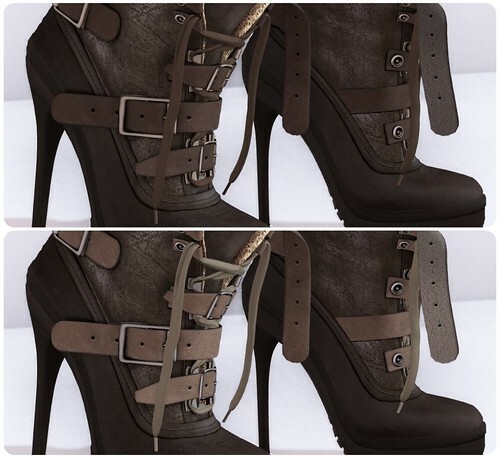 All the yummy color choices for the Maitreya Shearling boots. I think they look great with socks on than without!